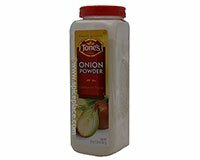 Onion powder has a fine texture that makes it well suited for sauces, soups, and gravies because it will add onion flavor, and yet dissolve into the food. It's best to blend with a small amount of liquid from recipe before adding to soups, stews, gravies, sauces, meats and casseroles. It's also excellent mixed into dry barbecue rubs, and to sprinkle over steaks, roasts, and poultry as onion powder has a fine texture that can be evenly distributed over foods. Usage: 1 tsp onion powder = 3 tbsp (1/4 cup) fresh onion, chopped. Broccoli Casserole III More Recipes..